Google Analytics is extremely comprehensive and full of detailed information about who and what might be visiting your website. However it is not very end user friendly and it is easy to get lost in the web based user interface. Accessing your stats on the go is a quicker and more convenient way of viewing these stats and while no replacement for the web based interface it comes pretty darn close with apps such as Analytics Pro that also supports exporting and printing. Maybe it is a bit misleading having the VS in the title since I actually use both of these apps equally, a little bit depending on how much time I have on my hands and how much info I want to access. Read on for a comparison of these two apps for the iPhone. After selecting your profile you're presented with this page where you can get summaries and more details. At a first glance you would probably assume that this is the more advanced Google Analytics app of the two, an assumption that would be correct in this case. There are many more visible options and more buttons to click, which can get a bit confusing at first. It’s more in your face and not as subtle (or should I say hidden?) as in Quicklytics. It takes quite alot of navigation to get to the meaty parts and the statistics that you are after. Once you get there though it is nicely presented using graphs and lists plus support for a landscape mode to display fullscreen graphs, something that I don’t use that often, but still a nice touch. Both of these apps support multiple profiles. However, something that contributes even more to the extra clicks is that in Analytics Pro it doesn’t remember the profile / website that you were on last time you used the app, meaning you have to click your way into it every time. This becomes quite tedious when you focus on a specific site but have plenty of other sites in your Google Analytics account. It also takes some processing time for it to refresh stats when starting the app which will force you to wait even more. Graphs look even prettier in landscape mode. When you first enter your profile you can get pre-defined summaries of today, yesterday and the last 28 days which provide a nice overview of everything from keyword stats to top content, all listed on one page for you to scroll through. If you wish you can define your own time period using a nice calendar view. Something that I couldn’t find was a setting where you could compare your stats with a previous time period though, something that Quicklytics has (albeit a bit limited). To Analytic Pros defense I can say that the daily visitor list handles comparison on a day to day basis quite good though. 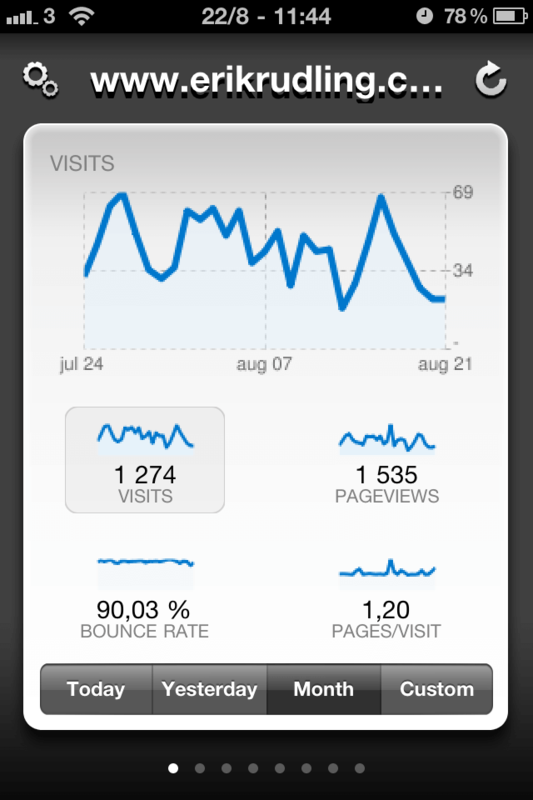 Analytics Pro has a clean and good looking user interface. This is the keyword analysis graph. A very nice feature in Analytics Pro is that it supports export of your statistics to a text- or PDF-file which you can email to yourself. It also has support for printing which is a very nice touch these days with the recent release of Air Print and Google Cloud Print. 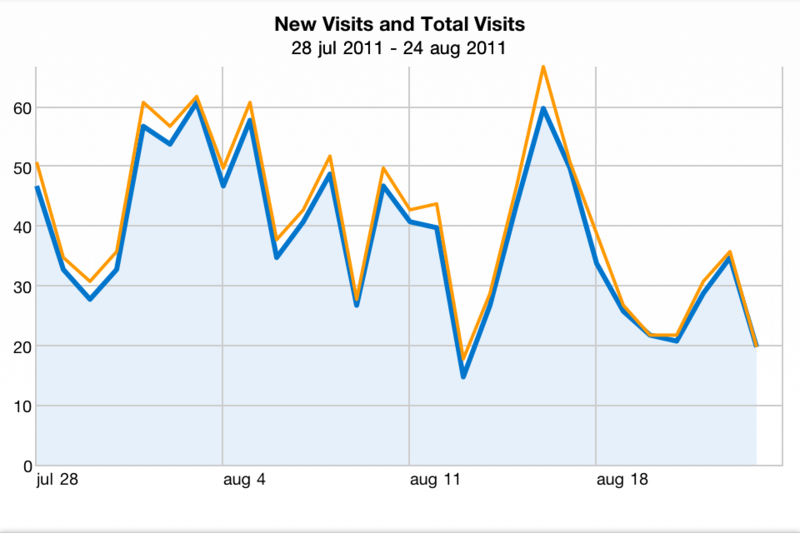 When entering Quicklytics you're instantly presented with statistics from your Analytics profile. While Analytics Pro most definately is the more advanced and better looking of these two apps Quicklytics focuses on ease of use and accessibility and that is why I like it. 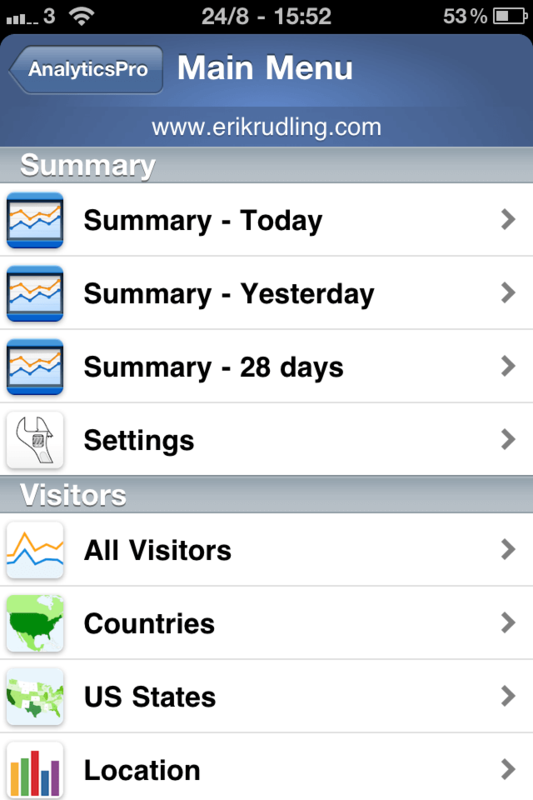 Unlike Analytics Pro Quicklytics remembers the profile that you were previously on and as soon as you start the app you are presented with small graphs showing visits, pageviews, bounce rate and pages/visit. You can easily change the time period that is displayed either to the pre-defined intervalls which are today, yesterday and month or just add your own custom intervall. A quick swipe to the left or right and you can get this overview on each of your Google Analytics profiles. Should you require more detail you can click on the big graph and you will be presented with a list containing more filters such as operating system, hostnames and browsers. The presentation of this information is quite grey and bland unlike Analytics Pros colourful and detailed graphs with landscape support. That stats presented can be compared to last week or last day which is more than what Analytics Pro had, but I would still want more in the comparison department. And even though Quicklytics allows you to easily swipe between your profiles I would wish for more of an overview just because it would be easier to quickly select a specific profile. The order in which the profiles are presented can be defined in the settings, but still. Keyword analysis and comparison with a previous period after navigating further into Quicklytics. Should you choose Analytics Pro or Quicklytics? 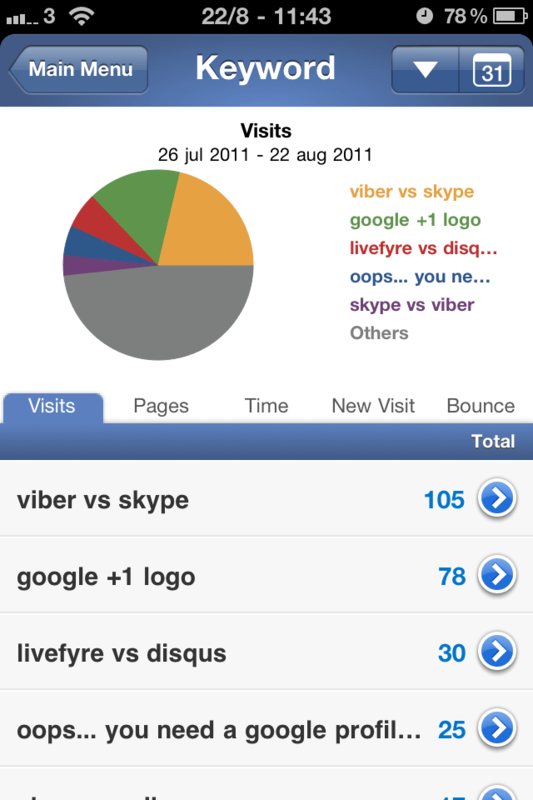 The answer lies within you and the way you want to access Google Analytics on your iPhone. 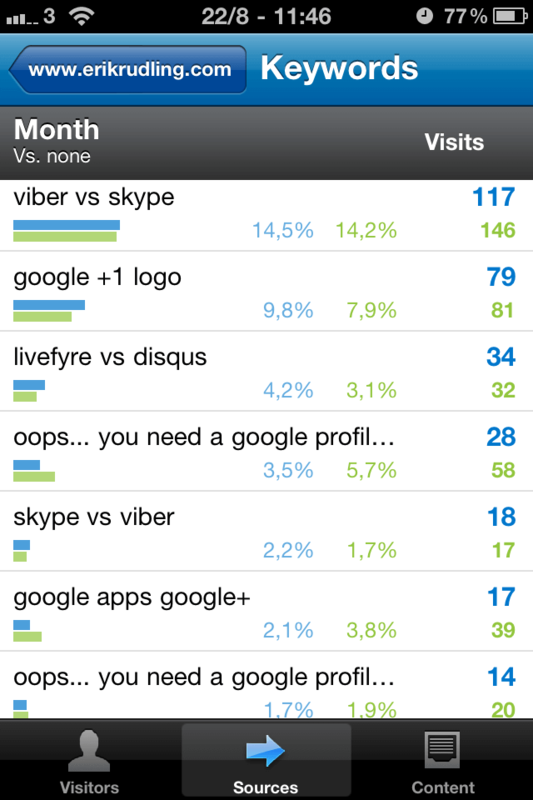 If you only want to view quick visitor stats and get to the more advanced analysis when you get back to your computer, go for Quicklytics. If you wish to get more detail, nicer graphs and export features go for Analytics Pro it is the more complete of the two which also shows in the higher price tag. Or, you have the obvious choice of going with both, which I did. I think it is worth it and I do use them both equally. If I quickly want to show my colleagues how many more visitors this blog has compared to our company website I fire up Quicklytics every time, because it is displayed instantly. If I am away from the office and without access to a computer Analytics Pro is my poison.